I’ve been meaning to rant about this one for a while. I like to say that “decaf” is not “coffee”. 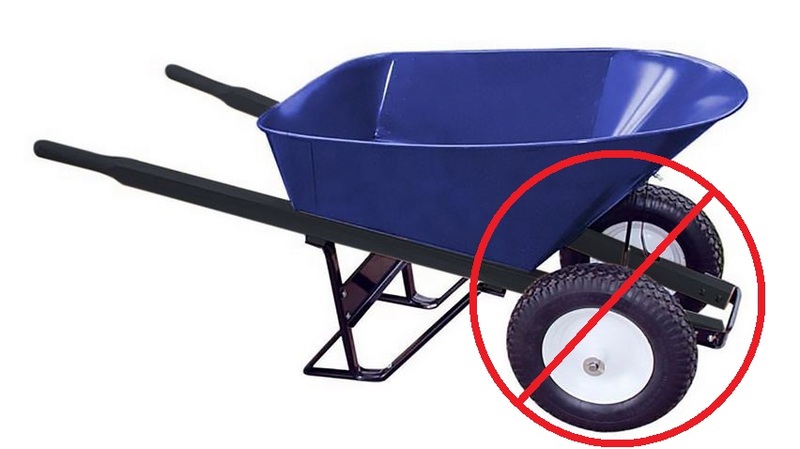 At the same time, a two-wheeled wheelbarrow is not a “wheelbarrow”. Haley and the girls at the barn love them, and yes I understand that it makes things easier when you are small, but that is not the point. You lose the process of gaining valuable skills when there are two wheels in the front of a wheelbarrow. Balance: It is not easy when there is only 1 wheel in the front. Every time you go to move something and you lift the handles, you have to be thinking about balance. That means that as you load the bucket, you think about how and where you fill, even distribution, stacking vs the hill you are on, forward vs back placement. It requires thinking ahead and planning. Grade: You can’t take a 2-wheeler cross-wise on a steep hill, it just won’t work because the wheels have to stay parallel to the earth. All of your choices on how to get from point A to B are limited when you can only think 2 dimensionally to the hill you are working against. It limits the variables you assign to the challenge. Do I keep the weight light and go straight up the hill? Or can I add more weight and work against the grain? Strength: Let’s face it, the shoulder strength needed to lift a single wheeler and the micro adjustments necessary to keep it balanced throughout the run, can greatly enhance your long term health. Stronger shoulders means more neck strength meaning less long term pain as you get older. Lifting more weight for balance, means you are constantly engaging your core to keep yourself upright. Risk vs Reward: “When I was a kid” we heated with wood in a cast iron Vermont Castings stove in the living room. Every year mom and dad would order two cords of wood and we would move it from where it was dumped on the driveway to the back of the yard and stack it along the property line. Each run started with a steep up-hill slope gaining about 4 feet of elevation over a ten foot span and then leveled off for about 30 feet and then the last 50 feet or so gained another 3 feet of elevation finishing such that you had to turn the wheelbarrow 90 degrees to park on the flat parallel to the pile (another off-axis slope). This was hard. You had to get a good running start for the first hill and then save enough strength for the long haul and still avoid bumps. I hated taking multiple trips. LONG before there was any term called “gamification” I would challenge myself with how much I could stack in the wheelbarrow without it all falling out. Heaven forbid a piece fell out the front. It was hard to recover from the bump which almost always forced the wheelbarrow to tip over, losing everything. It was a risk. You would lose all your gains and waste a ton of time. But stacking too little meant that each run plus the walk back, kills time. If I wanted to get back on the Commodore 64 (yes I am THAT old), I had to finish the wood. Time was important. Yes I know these things seem silly. And yes later we got the tractor and trailer and so things got a lot easier. But then I learned other skills, like backing up a trailer. Yes I know this wasn’t exactly ‘farm living’ and I had it pretty easy in comparison to families that required real work on a daily basis. But somehow this 2 wheel thing just makes me think back on all the things I learned in little subtle ways by arguing with that damn 1 wheeler. I’ve ranted about this before, that as life gets simpler, skills aren’t being replaced with other challenges. My tractor example is perfect to illustrate this. Kids can barely drive a standard transmission today, never mind backing a trailer into a driveway. When Haley and the crew are at the barn, they certainly do their fair share of hard work. Mucking stalls is not exactly fun, and yes I have seen them gamify the experience…by running up and down the muck pile…yuck. But I also watch as they load the wheelbarrow (missing 20% of each pitchfork throw, don’t get me started) and then push it over to the pile. They will lift and tip the wheelbarrow to dump, and as it is perfectly balanced in the air, on two wheels, reach into their pockets, pull out their cell phones…and post on Instagram/FB/Snapchat. Is that the new “skill”? With that thinking you should have cut your own 2 cords of wood. Whats the point? You wpuld have learned accuracy with a dangerous tool, you would have learned hand eye coordination. Found out which woods split well, which dont. Maybe ypu wpuld need s maul or a splitting wedge. You would develop broad shoulders instead of a narrow mind. The list like yours is endless. Lady that minds my horse has Parkinsons; im so glad she has a 2 wheeler. Thanks for your article. 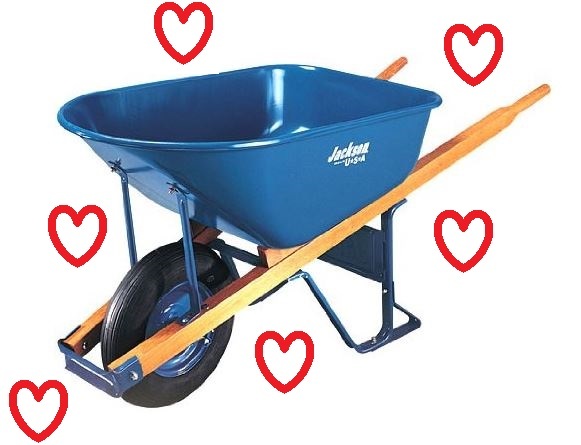 Found it when i was looking for wheelbarrow plans. I don’t believe in filtering out comments that aren’t spam, even if they are just negative internet shaming like this one. But thank you for your ‘feedback.’ Oh well, you can’t please everyone. The post was somewhat tongue in cheek which for some reason was not evident here. For the record, we often cut our own wood from logs and split it. Yes, we owned one of those heavy solid steel mauls. And I agree that learning that skill is valuable as well, it certainly made me stronger. I’m not sure how you make the argument that I am narrow minded, it seems that by not reading all my other content on the site, you have proven yourself to be narrowly focused: How could I possibly convey the breadth of my intellect in a single blog post? That observation is frankly “myopic.” You do raise an interesting point about people who are physically unable to operate a piece of equipment. In that case a 2-wheeled wheelbarrow certainly makes a lot of sense. I thought it was clear that my argument was for younger kids learning basic barn skills rather than adults late in life changing the way they perform a skill, but if not, I hope this clears it up. I also advocate for people learning to drive a standard transmission, but similarly, if someone lost their left leg, I wouldn’t be critical that they physically could not.